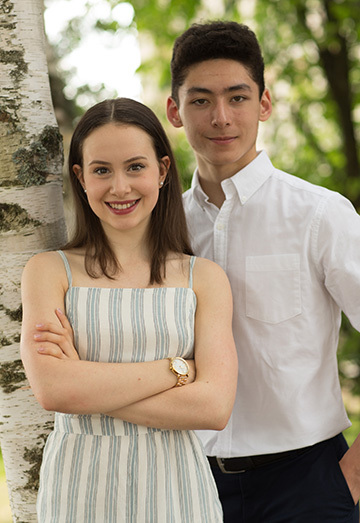 We are Emma Gunter and Caleb Wein, junior level ice dancers who represent Team USA on the international circuit. We hope you enjoy your visit while learning more about us, our partnership and accomplishments. Since teaming up in 2013, we have become three-time medalists at the U.S. Championships. We are in our third season competing at the Junior level. We have been honored to represent our country at several international competitions. This year, we won first place at the 2018 Lake Placid Ice Dance International and also competed for Team USA at Junior Grand Prix events in Canada and Armenia. We train in Maryland with coaches Alexei Kiliakov, Elena Novak, Dmytri Ilin, Greg Zuerlein, and Ramil Sarkulov at Wheaton Ice Skating Academy.